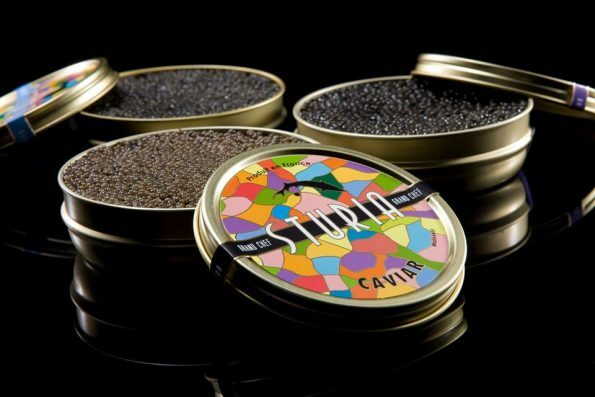 France’s Artisan Caviar Pioneer STURIA Debuts in the U.S.
Sturia, France’s original artisan caviar producer, is proud to announce its launch in the US, with its Haute Couture collection of custom-made, flavorful caviars. Forget about the caviar you know: with its wide-range of selections that will delight every palate and its iconic packaging, Sturia caviar will shake up all habits. Allez! Delicately designed by hand from start to finish, Sturia’s Haute Couture roes are selected and cured with extreme care by the most experienced industry artisans, leveraging both traditions and innovations to create inimitably exquisite flavors that are tailored for each and every taste, both connoisseur and occasional. Sturia offers a selection of low-salt, subtle caviars that are characterized by their finesse. Savored as such or paired with drinks, appetizers and a diverse range of cuisines, from fish and cheese to wine and veggies, Sturia Haute Couture collection complements moments of celebration, indulgence and creativity. Leveraging 30 years of ethical excellence from sustainable sturgeon-farming pioneer and parent company STURGEON, Sturia produces 13 tons of the highest quality caviar a year across eight production sites, including Europe’s largest fish hatchery, six natural ponds and a R&D facility in the southwest of France. Located in Aquitaine, France, the birthplace of French caviar with fish farms across Gironde and Charente-Maritime, Sturia ponds have been instrumental in conserving and reintroducing European sturgeons to an enhanced natural habitat, where they are meticulously fed granules, plants, minerals and vitamins. The company also pioneered the use of ultrasound for sorting out sturgeons – a technique that has been adopted by all fish farmers around the world since. “Innovation and sustainability are at the heart of everything we do,” said Laurent Dulau. “Our research and on-site teams pay particular attention to the water temperature as well as the wellbeing and weight of sturgeons in order to produce naturally flawless roes and caviars,” he added. Sturia caviar will be available on the U.S. market at www.sturia.com in October 2016. It is already available at gourmet grocery NYC store Le District and restaurants L’Appart and Bagatelle. Sturia is the flagship brand of Sturgeon, the Gironde-based company established in 1995, and French pioneer for breeding Siberian sturgeon [Acipenser baerii]. Sturgeon produces, selects and markets its products, and in just twenty years, has become the world’s third largest producer of caviar [production in 2012 exceeded 13 tons]. The quality of Sturia caviar is now recognized throughout the world by the greatest starred chefs, and contributes to promoting the idea of French luxury and gastronomy on an international level. This reputation owes nothing to chance: all caviars from the Sturia range are the result of careful selection. The Haute Couture collection offers a wide range of visual and gustatory sensations that meet the individual expectations of every caviar lover. Sturia Caviar was awarded a special prize at the 2013 Innovation Award for its “ONE” innovation, the first individual “all-in-one” haute couture caviar service.